Thanks in large part to Saeed Khan, the University of Florida is home to one of the nation’s leading programs in urolithiasis, the study of the formation of bladder and kidney stones. Since the 1980s, Khan’s research has focused on the role of calcium oxalate in the development of kidney stones, a common urological problem. Until recently, researchers believed oxalate only provided an ingredient for the formation of stones. But Khan has shown that excessive amounts of oxalate, a common occurrence in stone patients, damage the kidneys, altering the secretion of inhibitors that control stone formation. Khan’s research also focuses on cell response to toxicity and fluid dynamics in the kidneys and their effects on the formation of kidney stones. He has developed the most commonly used animal model of calcium oxalate nephrolithiasis and is considered an expert on kidney responses to oxalate exposure. In recent years Khan has recruited some of the nation’s top urolithiasis researchers to UF’s nationally recognized Urolithiasis Research Group. Khan, however, does not confine himself to the laboratory; he has a very active role in the university and the College of Medicine, as well as in national and international scientific communities. 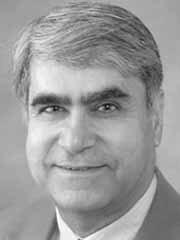 As a leading researcher on kidney stone disease, Khan consults or reviews many kidney stone research proposals for the National Institutes of Health and other national and international funding agencies. Khan is an enthusiastic teacher who mentors numerous graduate students and undergraduates through the University Scholars Program. He has authored or co-authored more than 250 publications, in such prestigious journals as The Journal of Urology, Kidney International and The Journal of the American Society of Nephrology. He has also edited a book on oxalate, proceedings of many international meetings and special journal issues dedicated to kidney stones.